Get 4% Back on all Foreign Transaction Purchases! I’ve recently picked up the Rogers Platinum MasterCard. It is currently one of the best cards for Canadians to get right now, because they’re offering a whopping 4% on all foreign currency transactions. This card is issued by Rogers Bank, which is the financial services company set up by the Canadian telecom provider. To provide a brief background, this card launched a year or so ago, earning a 1.75% rebate on purchases. They also waived foreign transaction fees, which makes them the only issuer along with Chase Canada to have this benefit for consumers. Unfortunately, this likely wasn’t making as much money as they had expected, so they changed up the system slightly. Beginning October 19th, they will now be levying a 2.5% foreign transaction fee, aligning themselves along most other Canadian issuers. To offset that, the card will now offer 4% cashback on foreign purchases. This makes the overall “rebate” 1.5% after October 19th. However, the positive outcome is that the increased 4% rate took effect on August 17. You now earn five points per dollar, with each point worth 0.35 cents, as well as bonus seven points per dollar for a foreign transaction, which makes a 4% cashback rate. This means that for the next two months, you’ll get that 4% rate without incurring any foreign transaction fees. 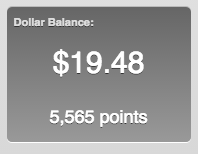 This is huge – given that your next best alternative was earning 1 Marriott Point/$ spent with the Chase Marriott Visa. I held off on posting about this just to confirm that they aren’t tacking on any fees. My purchases in foreign currencies have corresponded with the MasterCard Currency Conversion Tool, so it looks good so far. You may also redeem your Rewards in the form of an annual statement credit to your Account by calling Rogers Bank at 1 855 775-2265. You must request an annual statement credit for each year that you wish to receive it by December 1st of that year. Annual statement credits will be awarded in January of the following year and the amount credited will be the total dollar value of the balance of your Platinum Rewards Account as of the date the credit is issued to your Account. I travel a lot, so for me, this is the best thing to have happened since the increased 75,000 points bonus for the American Express Business Platinum Card. Given the 4% return, it’s also going to give you the best rate convert Canadian to US Dollars as you’re using the credit card interchange rate without having to go through any currency exchanges. Keep in mind that the TD Bank account in the US has no fees on ATM withdrawals, so I’m also considering moving all my funds to the US simply because US dollars are a lot easier for me to handle. If you’re thinking about applying for the card, you just need to make a realistic calculation of how much you’re going to be spending during these two months. You can add supplementary cardholders for free as well, so I’m perfectly happy to hand out cards for my close friends who don’t live in Canada. There’s a $29 annual fee for this card, waived the first year. It’s unlikely I’d be keeping the card past this year though as the foreign exchange fee makes the card essentially useless for my purposes. The signup bonus is $25 cashback for your first purchase. You can apply for the Rogers Bank MasterCard through this link. Unfortunately this is just them waiving the foreign transaction fee in a funny way. They charge a standard 2.5% foreign transaction fee, and here they make it seem like they are giving you 2.5% more for foreign purchases. Kind of tricky honestly because they aren’t being honest about where the money is going. Another trick by Rogers to lower its payback. When the new system kicks in Oct. 19, Rogers will actually be giving you less than before when making a foreign transaction. Previously, you got a straight 1.75% rebate, and paid no foreign transaction fees. Starting Oct 19 you will get a 4% rebate, but will pay 2.5% in foreign transaction fees, so the rebate (4%-2.5%) will be only 1.5% instead of the current 1.75%. Typical Rogers, changing promotions in a way that they gain and customers lose 0.25%. After I calculate the currency fee they charged, I actually received only an average of 3.29367% rebate out of the first 3 transactions in terms of the points they deposit me into the account. They only deposited an average of 3.29367% rebate for the 3 transactions I used after the new 4% foreign transactions rebate was kicked in when I calculate the currency they actually charged. Sorry I thought the first comment didn’t go through. The other issue I found with this card is that Rogers does not “do” automatic payments for monthly account balances at my bank (TD). So when I am out of the country for an extended period of time – 3 months – I have no way to pay the bill except by mail or phone. This is the only credit card I am aware of that does not give you the option of having the bills paid automatically. The numbers game they play with the foreign transaction fee is also troublesome and verging on dishonesty. Sorry Rogers that is not customer service as I see it so adios Rogers Platinum Master Card.